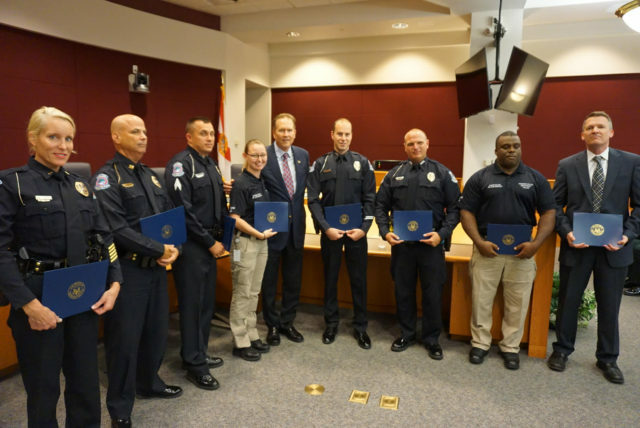 On the evening of April 16, the Sarasota Police Department Homeless Outreach Team (HOT) members received the 16th District Congressional Unit Citation Award from U.S Rep. Vern Buchanan of Sarasota, the Police Department has announced. The 2015 team members honored were Capt. Kevin Stiff, Lt. Lori Jaress, Sgt. Richie Schwieterman, Officer David Dubendorf, Officer Matt Kimball, Officer Matt Grochowski, Officer John Misiewicz, attorney Joe Polzak, and case managers Sherree Brown and Calvin Collins, a news release says. The Police Department works to educate homeless individuals about the services available through the local Continuum of Care, the release explains. Officers encourage individuals “upon every contact to meet with the Homeless Outreach Team and to accept transportation to service providers and/or the Coordinated Entry System, [where they can obtain services],” the release adds. “The Sarasota Police Department will also take enforcement action when education and encouragement have failed or the situation dictates immediate action,” the release notes. In 2015, the Sarasota Police Department Homeless Outreach Team contacted 5,344 individuals to offer services, the release says. Additionally on April 22, Sgt. Demetri Konstantopoulos received the 16th District Congressional Dedication and Professionalism Award for his work with the Turn Your Life Around (TYLA) Program, the release continues.